We specialize in providing complete commercial door, frame and hardware systems. Our Standard duty grade 2 and heavy duty grade 1 hardware delivers equal or higher durability than most of the well-known brand names at a fraction of the price. 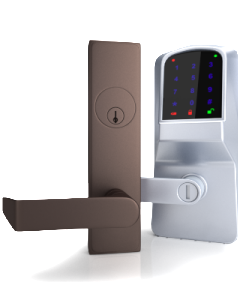 We offer a full selection of steel door accessories including commercial door locks, levers, panic and fire rated exit devices, commercial door closers, hinges, weatherization products and more. 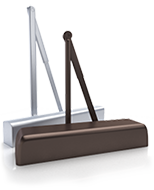 We offer a large selection of commercial door hardware and accessories to meet almost any requirement or budget. Shop Now. Grade 1 or grade 2 commercial lock sets, levers, deadbolts and knobs. 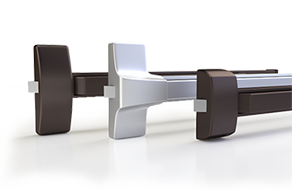 Regular arm, parallel arm, cush arm, and hold open door closer options available. 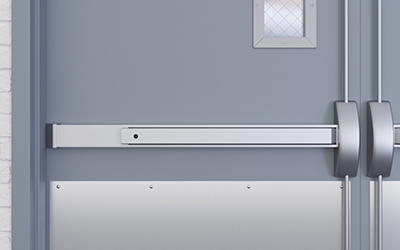 Fire rated exit devices and panic bars to meet life safety egress, wind load and fire code requirements. 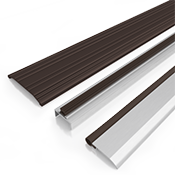 Aluminum thresholds, weatherization products, smoke and sound seals. 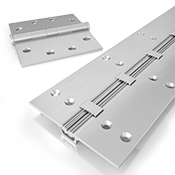 Hinges, flush bolts, push/pull/kick plates, stops, & accessories.